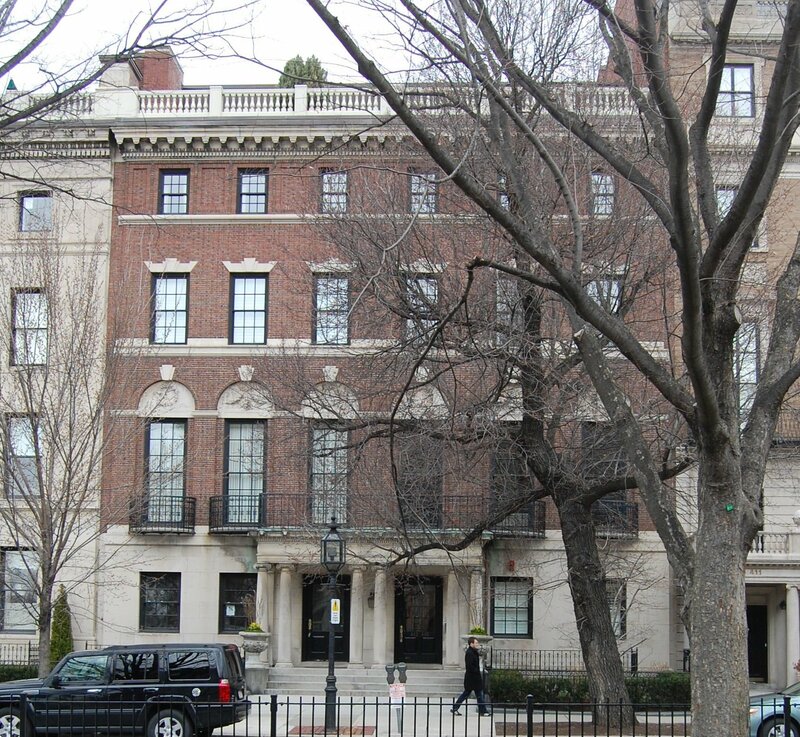 415 Commonwealth is located on the north side of Commonwealth, between Massachusetts Avenue and Charlesgate East, with 413 Commonwealth to the east and 24 Charlesgate East (419 Commonwealth) to the west. 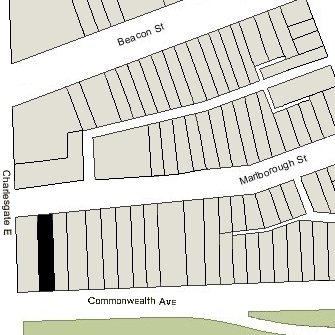 The rear of the lot on which 415 Commonwealth was built extends north to Marlborough Street and has a secondary street address of 464 Marlborough. Richard Olney purchased the land for 415 Commonwealth on May 28, 1890, from Walter Hunnewell. It was part of a 125 foot wide lot running east from Charlesgate East that Walter Hunnewell had purchased on December 21, 1885, from a real estate investment trust formed by Francis A. Palfrey, Francis A. Osborn, and Grenville T. W. Braman. The lot was part of a tract of land the trust had purchased on June 1, 1880, from the Boston Water Power Company. Click here for an index to the deeds for 415 Commonwealth, and click here for further information on the land west of Massachusetts Avenue between the south side of Beacon and the north side of Commonwealth. By the 1892-1893 winter season, Richard Olney and his wife, Agnes (Thomas) Olney, had made 415 Commonwealth their home. 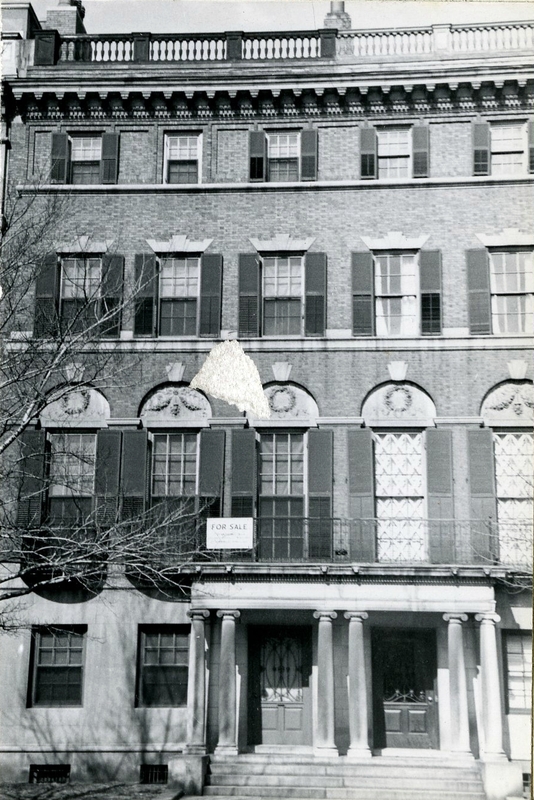 They previously had lived at the Hotel Kensington at 687 (307) Boylston, and prior to that at 241 Marlborough. They also maintained a home in Falmouth. In 1893, Richard Olney was named US Attorney General by President Grover Cleveland. He served in that position until mid-1895, when he was named Secretary of State, serving until March of 1897. 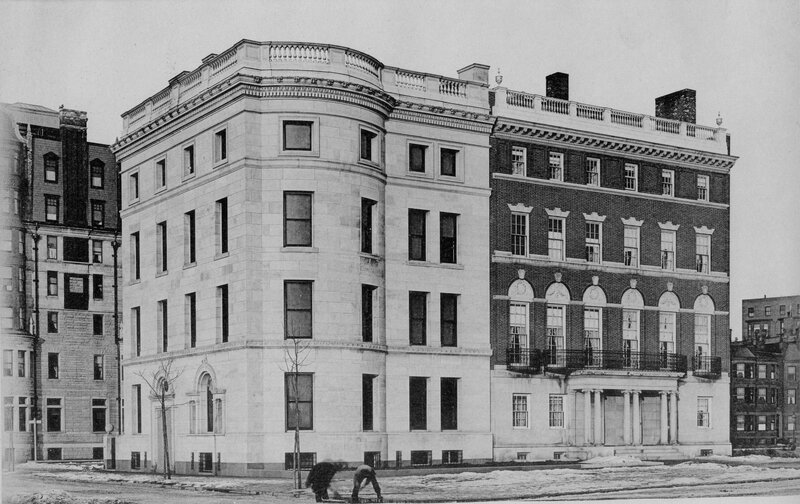 The Olneys continued to maintain their home at 415 Commonwealth during the 1894-1895 winter season, but during the next two seasons they lived in Washington DC. During the 1895-1896 winter season, 415 Commonwealth was the home of John Hitchcock, Jr., a lawyer and trustee of estates, and his wife, Esther Mary (Baker) Hitchcock. They previously had lived at 342 Beacon. 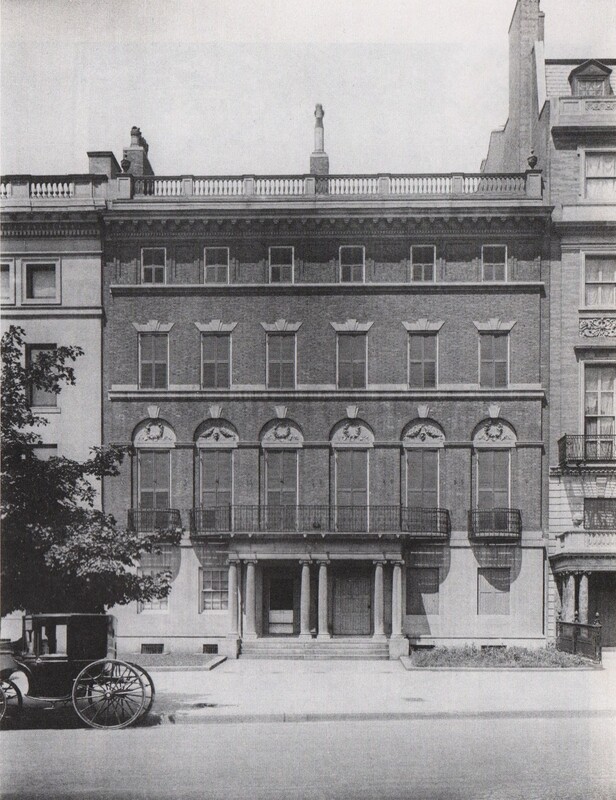 By the 1896-1897 season, they had moved to 117 Commonwealth to live with Mary Hitchcock’s mother, Mary Ann (Martyn) Baker, the widow of Ezra Howes Baker, Jr.
During the 1896-1897 winter season, 415 Commonwealth was the home of banker Eugene Van Rensselaer Thayer and his wife Susan (Spring) Thayer. They previously had lived at 17 Gloucester. They also maintained a home in South Lancaster, which they subsequently made their year-round home. The Olneys had resumed living at 415 Commonwealth by the 1897-1898 winter season. They were joined by their daughter, Agnes (Olney) Minot, the widow of George Richards Minot, Jr., a dry goods commission merchant who had died in January of 1894. They continued to live at 415 Commonwealth during the 1907-1908 winter season. 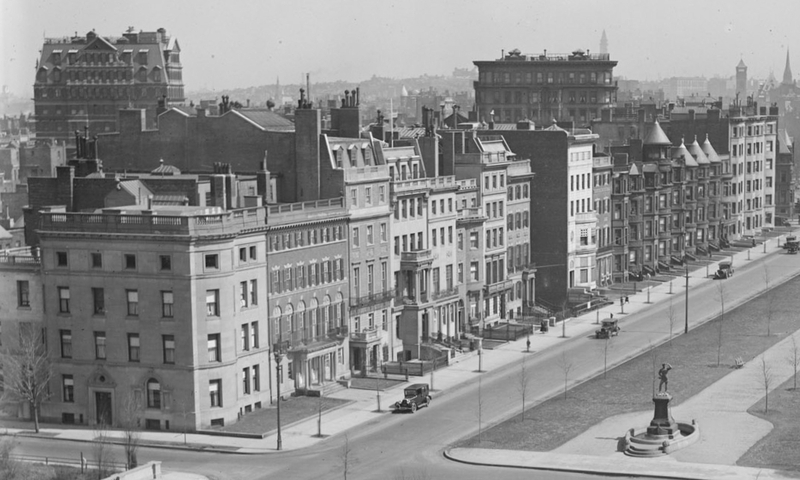 By the next season, the Olneys were living at the Hotel Touraine (southeast corner of Boylston and Tremont) and Agnes Minot was living at 5 Marlborough. On May 11, 1908, 415 Commonwealth was purchased from Richard Olney by Elizabeth Benjamin (Bliss) Perkins, the wife of Hamilton Perkins. They previously had lived at 25 Exeter with her widowed father, William Bliss, former president of the Boston and Albany Railroad, who had died in December of 1907. Hamilton Perkins had been a career naval officer, after which he became freight agent for the Boston and Albany Railroad. Hamilton Perkins died in January of 1918 and Elizabeth Perkins moved soon thereafter to Brookline. 415 Commonwealth was not listed in the 1919 and 1920 Blue Books. On June 7, 1920, 415 Commonwealth was purchased from Elizabeth Perkins by Florence R. (Stuart) Rust, the wife of Paul Drummond Rust. They previously had lived at 353 Commonwealth. They also maintained a home in Dublin, New Hampshire. Paul Rust was an investor in timber lands, wholesale lumber dealer, and investment banker and broker. He died in March of 1929. Florence Rust continued to live at 415 Commonwealth until about 1941. On June 5, 1942, 415 Commonwealth was purchased from Florence Rust by the Garland School of Homemaking (later Garland Junior College). It also owned 409 and 413 Commonwealth and 337-343 Commonwealth. In September of 1942, Garland School filed for (and subsequently received) permission to convert 415 Commonwealth from a single-family dwelling into a dormitory. In April of 1943, it filed for (and subsequently received) permission to change the legal occupancy from a dormitory to a lodging house. In October of 1944, Garland School acquired 411 Commonwealth.